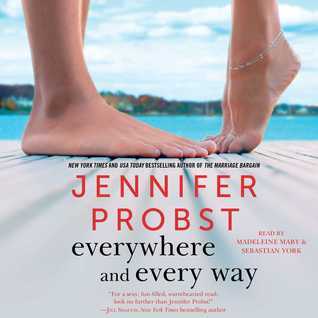 For years I've been hearing about Jennifer Probst and her books. I've wanted to read them, but never seem to have the time. After reading Everywhere and Every Way I intend to make the time. This is the first book in a new series, Billionaire Builders, and if this is anything like the rest of Jennifer Probst series I want to scoop them all up and binge read this summer. Everywhere and Every Way tells the story of Cal and Morgan. Cal (Caleb Pierce) is the oldest of the three Pierce brothers. When their father unexpectedly passes away Cal and his brothers are forced together (for the first time in years) and have to jointly run the company Pierce Brothers Construction. Due to terms in the father's will they have to jointly run the company and make a profit, basically starting from scratch. Seeing as the other two brothers had left town years ago working together is a challenge. Then Morgan comes on the scene asking (or rather, insisting) that the company build a house for her clients. Morgan is a designer, but she's more than that. She gets involved with a project from beginning to end. She's confident and expects perfection from both herself and others. From the beginning you can see that Morgan and Cal are meant for each other. They are so much alike that they almost hate each other. But the heat that they generate can melt anyone. When they finally do come together it's an inferno. Of course Morgan has her issues and there are problems, but in the end love conquers. I look forward to reading Tristan and Dalton's books and continuing this series. There are definitely some mysteries that I want to know about. I give Everywhere and Every Way FOUR AND A HALF STARS!